Bangkok City Culture is a gentle ride of 3 hours through the heart of Bangkok’s business-districts and of course we managed to set out a routing that avoids most of the traffic. Bangkok City Culture starts at our office at Rama III road where you can choose a bicycle that fits your body-length. Once on the way we will stop at a typical local temple, ride along the train-graveyard, through slum areas and visit the biggest daily fresh-market “Talad Klongtoey”. Here we park our bicycles and have a stroll on the market. All your senses will wake-up while walking here (if this not has happened before we reached this market) and you will be very busy with your camera. After the market we cross the always traffic congested Rama IV Road that brings us to Queen Sirikit Convention Center and the tranquil Benjakitty Park. In Benjakitty Park, a small, but very nicely designed park, we will have a break and rest a little while enjoying the views. We continue our Bangkok City Culture ride along the Tobacco Monopoly. This is the place where cigarettes are made. Sometimes you even can smell the scent of tobacco-leaves when cycling in the area. A little further we pass one of the most expensive streets of Bangkok “Thanon Witthayu” where many embassies are located. 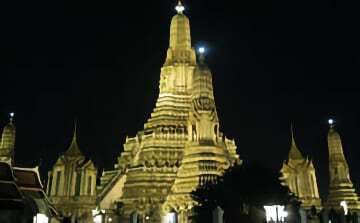 It also has an entrance to the famous, “Central park of Bangkok”, Lumpini Park. Besides of taking a break in this beautiful park we can see locals doing Tai Chi or Yoga and other outdoor activities. If we are lucky, we might meet the famous permanent residents of Lumpini Park, the huge monitor lizards! Although they look scary, they’re actually harmless. 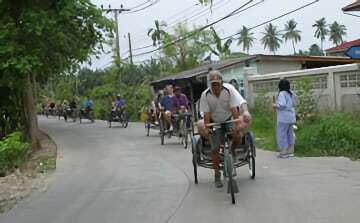 After the break we continue our Bangkok City Culture ride through small communities and finish at our office with a totally new Bangkok Biking experience.